Working with many parts with many manufacturing steps poses a challenge in keeping things organized. To have even a fighting chance parts need to be identified – labeled – to ensure that everyone know what the part is. Even with the sophisticated – ‘123-4567’ / project-part numbering scheme we very often need more information and to ensure that the next guy know what to do. 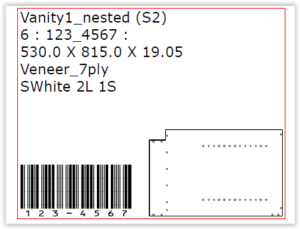 These have been expanded to include 5 Solidworks custom properties (one of which can be printed as a barcode) and an image of the part itself.